Replicate vs. Duplicate – What’s the Difference? Home » Replicate vs. Duplicate – What’s the Difference? When you make copies of something, are you replicating it, or duplicating it? It might not seem to matter—the meanings of these words are very similar. However, they are distinct, and the one you choose depends on how exact your copies are. What is the Difference Between Replicate vs. Duplicate? In this post, I will compare replicate vs. duplicate. I will use each of these words in at least one example sentence, so you can see them in context. Plus, I will show you a helpful memory tool that makes choosing duplicate or replicate much easier. What does duplicate mean? Duplicate can be a verb, a noun, or an adjective. As a verb, duplicate means to make an exact copy of something. When you run a document through a copy machine, you are duplicating it. The machine will spit out exact copies of the document you put into it. Duplicate’s noun and adjective forms are related—a duplicate is an exact copy of something, and as an adjective, duplicate refers to the quality of being an exact copy. What does replicate mean? Replicate has a similar but slightly different meaning. It can also be used as a verb, a noun, and an adjective. As a verb, replicate means to reproduce something, like research results or a piece of fine art. The noun replicate means something that has been reproduced, and the adjective replicate refers to the quality of being a reproduction. Replicates may not be exact copies of the original, in the way that duplicates are. If an art student paints Van Gogh’s Starry Night, the new painting is a replicate, not a duplicate, since it would not be exactly identical. Usually, in this context, however, one would call it a replica, not a replicate. 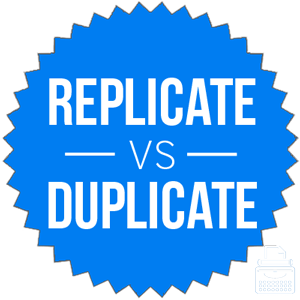 What’s an easy way to remember duplicate vs. replicate? Despite the similarity in meaning between these two words, there are enough nuances that you should use each carefully. A duplicate is an exact copy of something. A replicate is only a reproduction, even if it is not exact. Since duplicate and double both begin with the letter D, remember that a duplicate is an exact double of something. Is it replicate or duplicate? The words are just different enough to be distinct, so you should use them carefully. Duplicate means to make an exact copy and can also be used as an adjective and a noun. Replicate means to reproduce something, and can also be used as an adjective and a noun. 1 What is the Difference Between Replicate vs. Duplicate? Fillet vs. Filet – What’s the Difference?